“Spicy, spicy”, that’s what I like in anything. It doesn’t mean I don’t eat non-spicy things! We eat sandwiches once a week either for lunch or dinner and it is our best companion during journeys. Easy to prepare, easy to carry and is so filling. 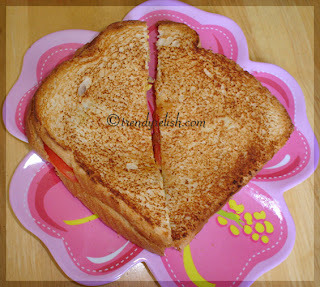 Here is one such sandwich I prepared recently. Arrange the cucumber slices on one bread slice and then place the cheese slice on top. Then arrange, tomato slices, jalapeno slices, onion strips (if using) in order. Pour some mustard sauce, some ranch and some hot sauce (if using) over these slices. Finally cover these with the lettuce leaves and place the other slice of bread on top. Heat a non-stick pan and place this prepared sandwich on it. Press softly with a spatula until one side turns golden brown in color. 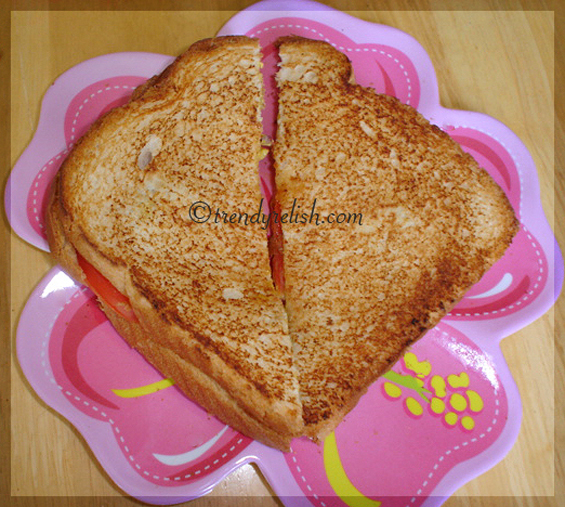 Then flip the sandwich carefully and let the other side get toasted into golden brown color. Be careful not to burn it. If desired you can apply butter on both sides of the bread slices before placing them on the pan. I didn’t do it though. Take out the sandwich carefully and let it cool for a little while, if you prefer to eat it cold. Then cut into triangles and enjoy with a glass of orange juice or any your favorite juice. The spiciness in this sandwich comes due to the jalapeno slices, hot sauce and the onion slices. 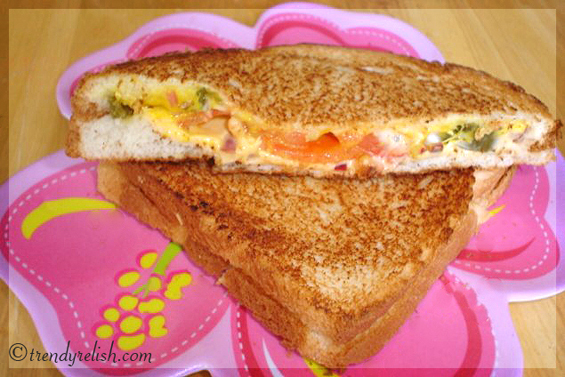 If you don’t prefer to eat it spicy, omit all those while making this sandwich. Isn’t this a very simple sandwich ever? This flies off to take part in the Sandwich Festival 2008 being hosted by Anupama of Food-n-More. Last but not the least; I was honored by Vandana Rajesh of Cooking up Something Nice, with this wonderful award. I am really so happy to receive it again. Thank you so much for thinking about me, Vandana! You have made me so overjoyed. That was so creative sandwich. Looks so good. Love the touch of spiciness in the sandwich. YUM! this sandwich sounds wonderul uma!! !love the cheesy look:)lovely entry. I think I need to have a drink, just reading the spicy ingredients. Earlier even I used to eat spicy food, but changed a LLLLLLoooooott now. First because of my husband and now I also got acid reflux problem, so going easy on spice. But I would love to try this sandwich without the extra heat. Congrats for the award and this sandwich looks tasty..
Congrats on the award. Sandwich looks great. I love toasted sandwiches. We love everything spicy too at home and always order extra jalapeanos. Loved your sandwich Uma. wow!looks so yumm and crisp uma:))I too love spicy foods!! I really adore them with every kind of filling. Congrats for the award! Deserved dear. Lucky you..you have such a kind hubby doing ironing..unfortunately mine helps me with everything else but ironing. Me too for spicy sandwiches. Looks very tempting. Congrats for the award too..
Spicy sandwich wow I love to have it right now. The pics is perfect and awesome. LOL!.. 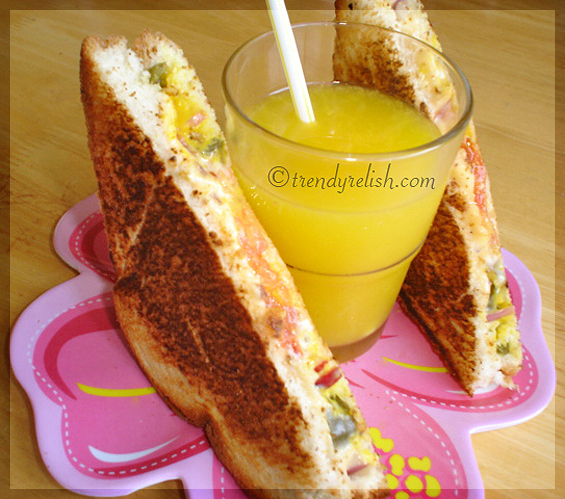 the sandwich looks yumm Uma..mine is coming up tomorrow and naaku kooda spicy things ante istham.. hehehe..:D btw I made ur itsy bitsy potato yest..check out my post today! Looks great,should give a try!! d-lish! jalapeno sure kicks it up a notch :) i like mine in pizza too! this would be a bit too spicy for me... but would definitely like a bite .. wonderful entry..
sandwich looks different nice one..
Amazing... Hey can u guide me how can i add my feed in Talimpu food aggregator?? the sandwich recipe looks delicious..the french mustard seems different. I am printing off ur recipe and filing it in my recipe book for using it often. sandwich looks yummy...i liked the pictures especially the last one where the juice glass is being sanwiched between the sandwiches!!!! The sandwich looks really good! Congratulations on your award! Sandwich looks yumm and Congratulations on that Award. Uma - meeku na blog lo oka chinna surprise! Thanks for dropping by dear....your blog is so lovely.....white n pink looks so pretty......will be visiting often....!!! Our team has found it to integrate into your blog ranking To Blog 100 USA. If you accept this nomination go through our website let their data and take our banner and paste in your blog. 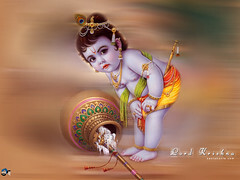 You have a surprise in my blog dear!!! Have a look!